Complementary and alternative medicine (CAM) is becoming increasingly popular in Europe with up to 65% of the population reporting that they have used this form of medicine. Approximately 30-50% of the European population use CAM as self-support and 10-20% of the European population has seen a CAM physician/practitioner within the previous year. 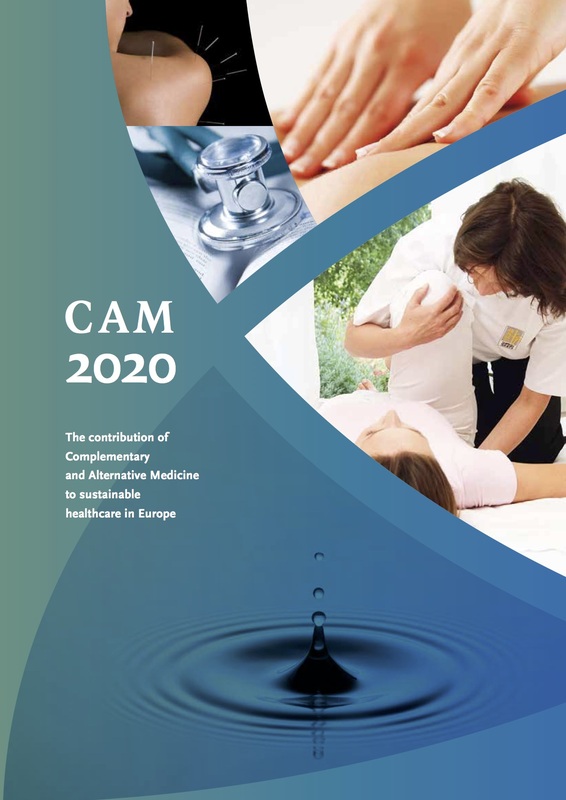 The most commonly used CAM therapies in Europe that are practised by medical doctors are acupuncture, homeopathy, phytotherapy, anthroposophic medicine, naturopathy, Traditional Chinese Medicine, osteopathy and chiropractic. The popularity of the individual therapies, however, differs widely between countries. This diversity is both a challenge for examining the state of CAM in Europe and an opportunity since its inherent plurality gives Europe a unique richness and leading position in the world in terms of the variety of approaches, high quality, integrated, holistic and patient oriented healthcare. The regulatory status of CAM in Europe reflects the diversity of acceptance, use and availability of these treatment approaches in the EU Member States. Due to a great variety of medical cultures and traditions in different parts of Europe, CAM looks back on a well-established tradition in some countries or is hardly recognized and available in others. There are three main models used to regulate the practice of medicine, namely direct government-administered regulation, government-sanctioned self-regulation and independent self-regulation . These models differ in the depth of direct government involvement and are often used in tandem with other acts, which may regulate certain aspects of the health service and medical practice. In most European countries the government authorises, registers and supervises the health professionals. The authorities can withdraw the authorisation of health professionals if the law is violated. This implies that the government, through the appropriate authorities, decides to what extent the use of CAM by regulated health professionals can be designated as “responsible professional conduct”. In some countries the law delegates the tasks of authorisation, registration and supervision of health professionals to the national medical associations. This implies that the national medical associations decide to what extent the use of CAM by authorised health professionals can be designated as “responsible professional conduct”. Some federations of CAM providers are developing what they call “self-regulation”. “Self-regulation” is a process in which associations of individual therapies develop their own statistics, educational programmes, code of ethics, research programmes and standards of competence. In some countries, self-regulation is required for an association to be approved by the government. A “registered” CAM provider must have a membership in a government-approved providers’ federation. According to the Declaration on Professional Autonomy and Clinical Independence of the World Medical Association (2008) individual physicians ‘have the freedom to exercise their professional judgment in the care and treatment of their patients without undue influence by outside parties or individuals’. However, CAM therapies usually do not have the same regulatory status as conventional medicine. They exist largely outside the institutions where conventional health care is taught and provided and in some countries the medical associations have even enforced strict regulations that thwart the practice of CAM by medical doctors, eg in Sweden and Slovenia. 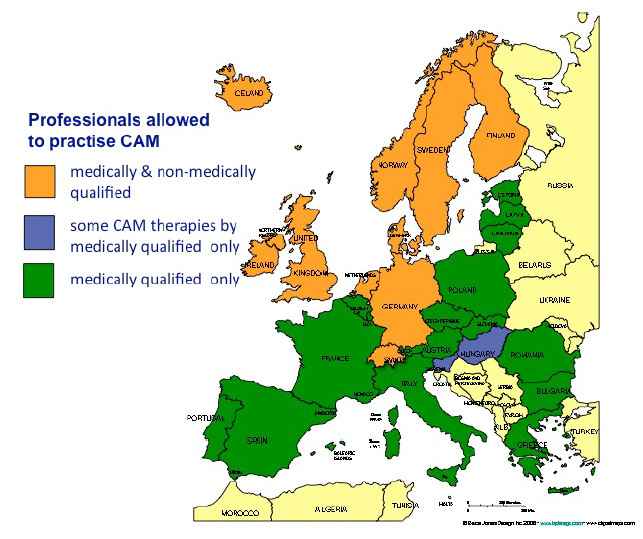 CAM is primarily provided by physicians in Middle and Southern Europe, the practice of CAM outside of regulated health care is illegal and violations are considered an offence. In Northern Europe anybody may provide CAM whilst only specific medical acts (e.g. treating people for infectious diseases, performing surgery, administering anaesthetics, prescribing drugs that require a prescription, giving injections, using X-ray) are restricted to medical doctors with a university degree, although the range of these medical acts may differ from country to country. This implies that the practice of CAM by non-medically qualified practitioners is allowed which has led to a situation where treatment providers outside of the established health service constitute the core CAM providers. In Hungary and Slovenia the law allows some CAM modalities to be practiced by non-medically qualified practitioners; some only by medical doctors. In Slovenia homeopathy, acupuncture and chiropractic/osteopathy are only permitted to medical doctors, in Hungary homeopathy, anthroposophic medicine, traditional Chinese medicine and acupuncture, chiropractic/osteopathy, ayurvedic medicine and traditional Tibetan medicine. Where is CAM statutorily regulated? In several European countries regulations are in place to facilitate the integration of CAM services with national health care systems, to provide equity of access to these services for patients and to coordinate training criteria. So far, however, the regulatory status of CAM is complicated by the different models applied in the EU Member States. Some countries have government-administered regulations or laws about the practice of CAM in general, some regulate specific CAM therapies, while still others have no CAM regulation at all. 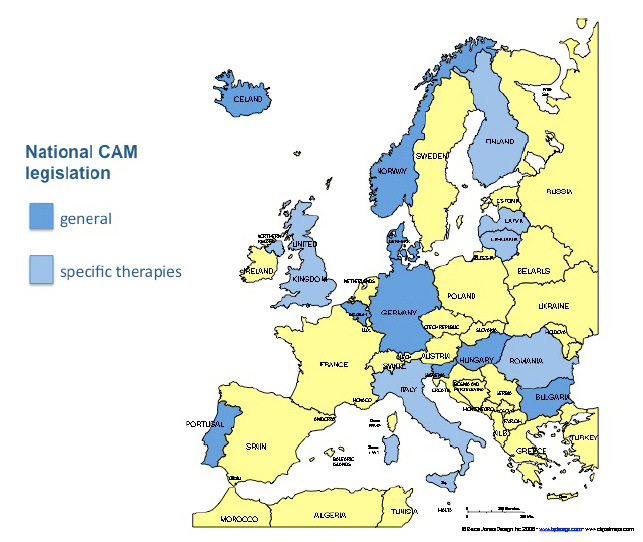 In 18 of 29 EU and EEA countries specific CAM therapies are statutorily regulated although wide variations exist throughout Europe regarding the types of CAM that are regulated. The next table shows details of the regulation of specific CAM therapies. The original table from “Concerted Action for Complementary and Alternative Medicine (CAM) Assessment in the Cancer Field” has been adapted and supplemented. Professorial chairs of CAM and/or Integrative Medicine exist in France (Nantes), Germany (Berlin, Duisburg/Essen, Rostock, Munich), Hungary (Pécs), Italy (Firenze and Bologna), Norway (Tromsø), Sweden (Stockholm), Switzerland (Bern) and the United Kingdom (Exeter, Sheffield, Southampton, Thames Valley). According to a survey published in 2006 , CAM education is available in 42% of medical faculties in the EU-15 countries and in 20% of faculties in the ‘new’ EU countries. CAM education is conducted by a separate department in 10% of medical faculties in the EU-15 countries and in 7% of faculties in the ‘new’ EU countries. Separate familiarisation courses in CAM are available in 42% of the EU-15 and in 20% of the ‘new’ EU member state medical universities. Separate CAM courses are compulsory in 13% of medical faculties in the EU-15 member states. There are no compulsory CAM courses in any of the medical faculties in the ‘new’ EU countries. Ersdal G (2005). How are European patients safeguarded when using complementary and alternative medicine (CAM)? Jurisdiction, supervision and reimbursement status in the EEA area (EU and EFTA) and Switzerland. Concerted Action for Complementary and Alternative Medicine (CAM) Assessment in the Cancer Field, Tromsø, Norway.